Are you more likely to hit the jackpot or find a four leaf clover? Jackpot Winner Or A Four Leaf Clover Finder? What are the Odds? #3: You are LESS likely to hit the jackpot than to find a four leaf clover! Finding a four leaf clover is traditionally a sign of good luck since they are so rare. But are you more likely to find a clover or hit the Irish Lotto jackpot? In celebration of Irish Lotto coming to Lottoland, in this month's What are the Odds I'll look at your chances of finding the fabled four leaf clover vs. hitting the Irish Lotto jackpot. Although we tend to associate the green clover with Irish luck people around the world have recognised its rarity and associated finding one with good fortune since ancient times. Throughout history many important people have carried four leaf clovers to bring them good fortune and protect them from harm. Why are there four leaf clovers? There has long been debate in the scientific community over what causes four leaf clovers. Some believed that the four leaves were caused by an internal variable, such as a somatic mutation while others produced evidence that the extra leaf was caused by an external variable present in the environment where the clover grew such as the pH value of the soil. Researchers from the University of Georgia however have been able to isolate a gene which seems to indicate that is a recessive gene is in fact the primary catalyst for creating the coveted four leaf variety. Finding a four leaf clover is not easy. Although certain patches are more likely to contain the recessive gene than others, in general scientists estimate the chances of finding one at about 1 in 10,000 if you searched one clover at a time. 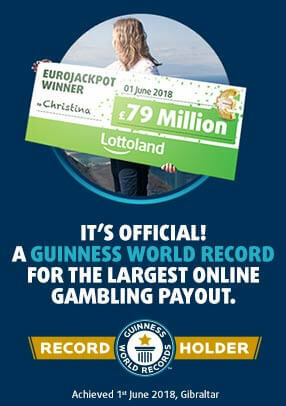 However that is still significantly better than winning the Irish National Lottery jackpot, which has the best odds of any major lottery worldwide at 1 in 8,145,060. Bear in mind that there are other ways to win when betting on the Irish Lotto - you have about a 1 in 10,000 chance of matching 4 numbers + the bonus ball which will give you a share in 2.5% of the total prize money. Since we are now able to grow four leaf clovers artificially their value has diminished and it costs less than a fiver to buy a four leaf clover online these days - so you're a lot better off with the couple hundred pounds you'd win! 1. There are also 5 leaf clovers which are even rarer - about 1 in 1,000,000 in nature. We are now also able to grow them as well so they only cost about a tenner to buy online! 2. In fact, it is possible to have mutations with even more leaves than 5. The world record for most clover leaves is 21 found by Japanese farmer Shigeo Obara. 3. Four leaf clovers have a long history in Celtic mythology. In Ireland four leaf clovers were traditionally associated with the four elements of nature: earth, fire, air and water and their respective deities Dana, Lugh, Njord and Llyr. To this day they are still associated with a particular type of faerie, the famous Irish leprechaun, who would wear a clover on his hat not for luck but for protection from the old Gods against robbers trying to steal his gold. 4. People often mistakenly refer to Irish four leaf clovers as "shamrocks". In fact, "shamrock" comes from the Gaelic word seamróg which is a diminutive form of the word for clover and refers to the common clover with three leaves. When Christianity came to Ireland, Catholic priests co-opted the old pagan reverence for the clover but instead of the rare four leaf variety representing the elements they chose the ordinary three leaf kind which they used this to teach heathens about the Holy Trinity. The Shamrock is often seen as the symbol of St. Patrick, the patron saint of Ireland although these references do not first appear until the 18th century. 5. Humans are able to get some nourishment from eating clovers, although only tiny amounts. Historical evidence shows that during the Irish Potato Famine many starving people resorted to eating shamrocks in desperation. Clover is said to have a strong bitter taste. 6. During the Act of Union 1801 the shamrock was incorporated into the Royal Coat of Arms of the United Kingdom alongside the Scottish thistle and English rose to symbolise the "unity" of the Three Kingdoms. The shamrock remains on the Coat of Arms even though Ireland is no longer a part of the United Kingdom. 7. The largest four leaf clover collection in the world belongs to Ed Martin Senior of Copper Landing, Alaska who collected over 111,000 clover since starting at age 2. This surpassed previous Guinness Book World Record Holder George J. Kaminiski of Pennsylvania who collected just shy of 73,000 within a prison grounds. 8. The world record for the most four leaf clovers found within 20 minutes is held by John Christian Stokes who found three four leaf clovers within 20 minutes. 9. American comedian and host of the hit Comedy Central Colbert Report angered some Irish-Americans when he joked on St. Patrick's Day 2010 that "the shamrock represents the Holy Trinity, the Father, the Son, and the Holy Spirit which is why the Four Leaf Clover is so Lucky -- You Get a Bonus Jesus". 10. Clovers are related to peas and as stated, do contain some nutrition which can be utilized by humans. 11. US President Abraham Lincoln carried a four leaf clover day almost every day for good luck. He did not have his clover with him when he was infamously assassinated in Ford's Theatre. 12. The best way to find a four leaf clover is to stand back and view a patch from a short distance. Oftentimes the human eye can detect a break in the "pattern" of a patch of clover and for reasons still unknown this tends to be the most likely place to find one of the lucky four leaf variety. 13. Legend has it that French general and little Emperor Napoleon Bonaparte avoided being struck in the head by a sniper's bullet when he bent over to pick a four leaf clover which he had fortunately spotted on one of his early campaigns. 14. Legend says that when Eve was forced to leave Paradise she took the four leaf clover with her for the good luck of mankind. Bet on the first ever Irish Lotto draw at Lottoland this week for £1 million. 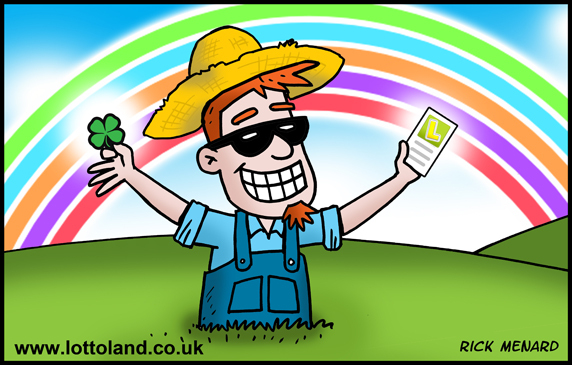 With the best odds of any lottery offered at Lottoland, your chances of being a lotto millionaire have never been better! And with a single bet line only costing £1.50 why not double the grand prize to £2 million with our Double Jackpot feature? You'll be in with a chance of banking the same prize as this week's National Lottery, but with 20% better odds of winning! Odds of hitting the Irish Lotto jackpot vs. finding a four leaf clover?